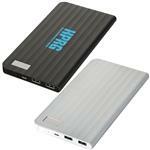 New slim custom power bank with a digital read out of remaining battery. With a slim design the UL Certified Resistor Power Bank with Power Check gives you the added power you need without the added weight. With a 4,000 mAh Grade A Lithium Polymer battery and a 5V/1A output you can charge your smartphone at the same rate as most wall outlets. The power check display tells you exactly how much power is left in the battery backup. 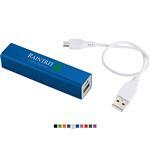 Includes a USB to Micro USB connecting cable which can recharge the battery backup or be used to charge up devices with a Micro USB input like Android Smartphones from Samsung, Motorola, HTC, Nokia, and others. This product has passed UL standards. 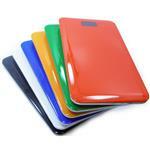 The slim power bank design is gaining in popularity! Available Imprint Options: Color Print. Laser optional.